But, from now on, you can turn any USB flash drive into a secure token! No need to purchase an additional expensive device. All you need is about 2 megabytes of free space on your flash drive or other USB gadget, such as an MP3 player, PDA or even a USB-pluggable mobile handset. How does it work? Our software, Double Password, installs onto your flash drive. When you type a password, the program intercepts it and converts it into a super-strong password string on-the-fly. You can use simple, easy-to-remember passwords without the risk of being cracked. Another benefit of using Double Password is that nobody can steal your passwords. Spy programs are useless. 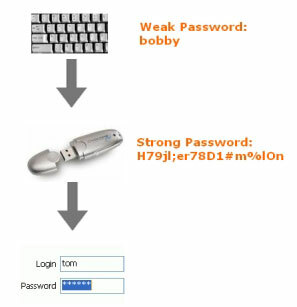 Even if someone gets the “weak” password that you type on the keyboard, it means nothing. This password will only work when your USB flash is inserted.